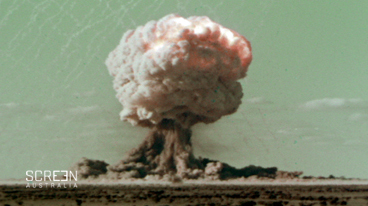 Video clip synopsis – Strontium 90, one of the deadliest poisons known, is a by product of the nuclear testing which Great Britain conducted in Australia in the 1950s and 1960s. Broadband MP4 fallout_bb.mp4 (13.4MB), suitable for iPods and computer downloads. Nuclear Fall Out is an excerpt from the documentary Silent Storm (52 mins) produced in 2003. From 1957 to 1978, scientists secretly removed bone samples from over 21,000 dead Australians as they searched for evidence of the deadly poison, Strontium 90 – a by-product of nuclear testing. Silent Storm reveals the story behind this astonishing case of officially sanctioned “body-snatching”. Set against a backdrop of the Cold War, the saga follows celebrated scientist, Hedley Marston, as he attempts to blow the whistle on radioactive contamination and challenge official claims that British atomic tests posed no threat to the Australian people. Marston’s findings are not only disputed, he is targeted as “a scientist of counter-espionage interest”. Now, questions are being raised about the health repercussions for generations of Australians. How did the Australian government respond to the threat of communism after WWII? Strontium 90, one of the deadliest poisons known, is a by product of the nuclear testing which Great Britain conducted in Australia in the 1950s and 1960s. The poorly designed tests resulted in nuclear ‘fall out’ over vast areas of Australia including significant population centres. At the time there was official denial of any threat or danger. Hedley Marston the Australian biochemist whose independent tests predicted that there would be problems in the future from this ‘fallout’ was publicly disputed and he was privately targeted as a ‘counter-espionage’ threat by ASIO. This discovery makes it clear that behind the official denials and assurances there was a realisation of danger for the Australian population. The ‘fallout’ from these tests continues today. Note the date and location of the nuclear testing in Australia. Note details of the test. Note what Marston reported after the test. Note Marston’s attitude to ‘fall out’. Note his concerns about government attitudes. Note the problems that occurred with this test. Result? Note the evidence of ‘fall out’ across Australia. Note how public were informed of the dangers. Note the government response to concerns about ‘fall out’. Note details of Marston’s tests. Results? What are the potential dangers from nuclear ‘fall out’? Short term? Long term? Why did the Australian government allow Britain to conduct nuclear tests in Australia? What provisions were made to ensure the safety of the indigenous Australians who lived in the Maralinga area? Result? Write a report on nuclear bombs and their by-products. Draw up a chronological table with details of nuclear tests conducted in Australia. Explain why the Australian and British governments kept the ‘results’ of these nuclear tests secret.